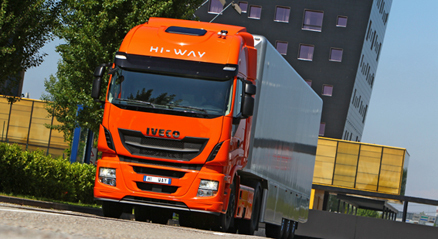 The Iveco Stralis Hi-Way has been elected International Truck of the Year 2013 by a group of 25 leading commercial vehicle journalists, representing 25 magazines throughout Europe, with a total readership of more 700,000 transport operators. With a winning score of 138 votes, the new Italian heavy-duty, long-haul truck fought off the strong challenge posed by Mercedes-Benz's Antos heavy-duty short-range distribution truck which collected 107 votes. Ford Otosan's New Cargo finished in the third place, while the all-wheel drive six-tonne Fuso Canter 4x4 was fourth. In accordance with the ITOY rules, the annual award is presented to the truck launched in the previous 12 months, which has made the greatest contribution to road transport efficiency from several different perspectives including: fuel economy, safety, drive-ability, comfort and a low-environmental 'footprint'. Iveco's Stralis Hi-Way features a highly-innovative Euro-6 engine technology, based on an SCR-only after-treatment system. This solution paves a brand new route in the TRUCK OF THE YEAR reduction of diesel engine emissions, relying on two pillars: a predictive algorithm to control the engine's operation and a hi-turbulence pipe to enhance the mixing of the exhaust gases and the urea. The Stralis Hi-Way's 'Hi-eSCr' engines, along with the further optimisation of its driveline components and improved cab aerodynamics, together provide a major contribution to negating the effect of the forthcoming Euro-6 emission legislation on the truck's fuel consumption. The Stralis Hi-Way's redesigned cab also offers the driver a quiet and relaxing work-ing environment - as ITOY jury members duly noted during their recent road test around Turin. Together with the Iveco's improved trim materials, hi-level ergonomics and comfort, these latest in-cab features help make life easier for professional drivers engaged in long haulage transport missions. The ITOY jury members further appreciated the advanced road safety features of the new Stralis Hi-Way and its innovative on-board telematics that, thanks to a 7 inch touch-screen in the dashboard, offers an extremely user-friendly interface. Moreover, the Driving Style Evaluation function of the telematics system allows the driver to trim his, or her, driving-style to achieve a better performance in terms of improving their fuel economy, thus addressing one of the main challenges faced by transport companies in today's difficult business environment. Summing up the ITOY's jury vote, International Truck of the Year chairman Gianenrico Griffini commented: "With the new Stralis Hi-Way, Iveco has delivered a state-of-the-art heavy-duty, long-haul truck with an innovative engine solution and advanced telemat-ics that will make a substantial contribution to lowering the total cost-of-ownership for Europe's truck operators".